The Fall 2016 release of Dynamics 365 App for Outlook includes many significant changes. This blog post describes supported clients for different app features in the context of Office Add-ins. The first major improvement is hybrid support. Starting with the December 2016 update of Dynamics 365, you will be able to use the app if you connect Dynamics 365 (on premises) with Exchange Online, or Dynamics 365 (online) with Exchange server (on-premises). Please note that if you use Dynamics 365 (on-premises), you need to authenticate with IFD authentication. To take advantage of Office Add-ins on Windows desktops, you must have Outlook 2013 or Outlook 2016, and Internet Explorer 11 or later must be installed (but doesn’t have to be the default browser). One of the following must be set as the default browser: Internet Explorer 11 or later, the latest version of Microsoft Edge, Chrome, Firefox, or Safari. If you use a Mac, you need to have Outlook for Mac and the latest version of Chrome, Firefox, Safari, Internet Explorer 11, or Microsoft Edge. You can also use Dynamics 365 App for Outlook by browsing to the mobile version of Outlook on the web. This means you can browse by using the native browser on your mobile device. The supported operating systems are iOS 8 or later, Android 4.4 KitKat or later, and Windows 8.1 and Windows 10. Note that the Dynamics 365 App for Outlook support matrix is a subset of Office support. Also, due to authentication limitations on mobile devices, we only support Dynamics 365 (online) when connected to Exchange Online. What about composing email and creating meetings? The Office Add-in support matrix is different, based on your client, and whether you use the add-in for received email, composing email, or creating meetings. For composing email, if you want to track email before sending it, you need to have at least Exchange Server 2013 CU14. This is also true If you want to track appointments or meetings. Mobile Outlook on the web supports composing email, but you can only track email (you can’t add templates, for example) since the mobile editor does not support HTML. Finally, Dynamics 365 App for Outlook supports contact tracking and syncing by using the Outlook module add-in, which is supported by Exchange Server 2016 CU3 or Exchange Online and Outlook 2016 CR2. The table below summarizes the support described in this blog. 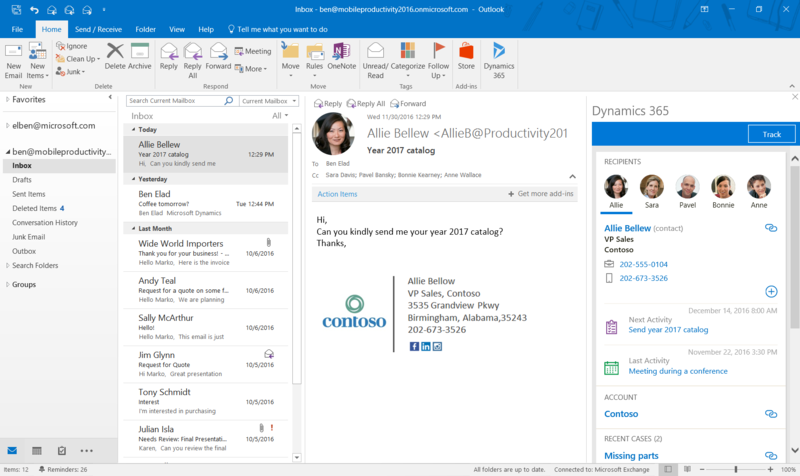 In my next blog, I’ll discuss contact tracking in Dynamics 365 App for Outlook. Stay tuned! Outlook on the web supports IE 10, IE 11, Edge, Safari 9, Safari 10, Firefox, and Chrome. Mobile Outlook on the web supports Windows 8.1, Windows 10, iOS 8, iOS 9, iOS 10, Android KitKat (4.4), Android Lollipop, Android Marshmallow, and Android Nougat. Tracking email in compose mode and tracking appointments requires Exchange Server 2013 CU14 or Exchange 2016. Adding email templates, Knowledge Management articles, and sales literature is not supported in Mobile Outlook on the web. Tablets are not supported at this time (coming CY2017).